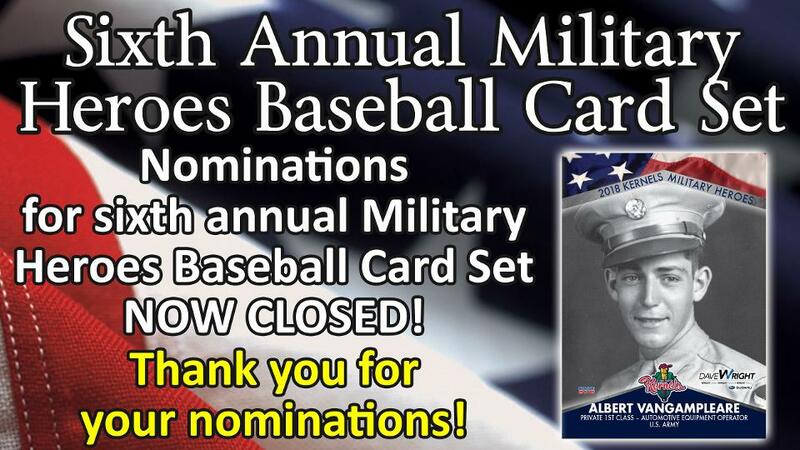 Cedar Rapids, IA - The Kernels are proud to announce that we have collected all the nominations for the 2019 Military Heroes Baseball card set and nominations for this year's card set are now closed. Thank you to everyone who submitted a military hero for this year's set! We still encourage active duty personnel, veterans and their families to attend our Military Heroes Night on Thursday, July 4th at 5:05 PM. The Kernels will wear special patriotic jerseys that will be sold via a silent auction with the proceeds to benefit the ALS Association - Iowa Chapter and we will be honoring all veterans and active duty personnel during the game. With the strong interest in each of our Military Heroes Baseball Cards sets, the Kernels plan to continue this annual tradition by releasing a seventh Military Heroes Set for the 2020 season. Nominations for this set will open in mid-November of 2019.